Election Day is more than a year away, yet already the presidential campaigns have begun. Given previous contests, we should most likely expect a good deal of disingenuous diatribes and debates—some of it from the candidates, and even more of it from their supporters. In anticipation of the coming ugliness, it seems as good a time as any to learn something about civil disagreement and the possibilities of persuasion from an unlikely source: the Puritans. That may surprise us. After all, when the Puritans had a dispute, they really had a dispute. The world came to them through a theological lens and their very souls depended on getting that vision right, which meant that disagreements about God could lead to excommunication, banishment, or worse. If we think that civil debate is sorely lacking today, we should try living in the seventeenth century. As with all things Puritan, however, this stereotype of intolerance is more complicated than it first appears. The reputation Puritans have garnered for less-than-civil disagreement certainly has a basis in reality, but it also obscures the range of differences they accepted and attempted to work out amicably. On the one hand, they openly touted their intolerance, as they thought it was a good sign of godliness to get rid of heresies. On the other hand, they advanced a careful, psychological model of persuasion that created a certain space for civil debate and may have much to teach us today when we think about our own all-too-frequent lack of civility. Here is the simple idea: love comes before logic. When someone speaks, no matter how reasonable he or she might be, if you hate that person, you are unlikely to listen. And the opposite holds as well: if someone dislikes you, it does not matter how reasonable you might be, your logic alone will not persuade. We listen to friends, not enemies, particularly when it comes to critique. In other words, the Puritans believed that a lack of love makes it hard to hear. If a disagreement was going to proceed civilly—if it was going to be aimed at actual edification—then only an underlying unity of affections (some basic sort of sympathy with one another) would make it possible. This need for underlying affection appears all over Puritan texts. In Puritan theological disputes, the first question was whether the disagreement proceeded from a “love of the brethren” or from hatred of the godly. Assuming the first, the disagreement could be picked up and debate could ensue. “Since we detect…a love of brethren in your compassions and…a love of truth in your concern, admiring…the piety in both, we believe it will be profitable to pick up the correspondence with you in scholarly wise,” one preacher wrote. Or, as the English Puritan minister John Dodd put it, “As they do thankfully accept your brotherly love, so they our brethren here have taken your motion into serious consideration.” An assessment of underlying love made it possible to consider others’ claims. I find this Puritan model helpful for two reasons. First, because of what it calls upon us to consider when we hear criticisms aimed at us; and second, because of what it requires from us when we make criticisms of others. In both cases, a great deal depends on the spirit behind critique. If someone claims that we have a misguided policy or a mistaken belief we ought first to ask: Why are they bothering to critique us at all? In general, the Puritans claimed that if it came from a mutual affection or a motion of love, it could be profitably taken up and considered, and some kind of consensus might be reached. If, however, the criticism came from simple hatred or contempt, then it did not need to be considered seriously; it was not aimed at edification but destruction, and nothing edifying for both parties could come from engaging in the debate. The idea of edifying both parties is important, for the Puritans spent plenty of time attacking others or defending against attacks. But they did not do so for the sake of their interlocutors; they did so to edify the godly who might be witnessing this dispute. The Puritans insisted on an inside and an outside, the godly and the ungodly, often imagining themselves as members of a small, persecuted community. Such a mentality limits the ability to listen and turns the vast majority of criticism into mere attacks on the faith. Given the consequences of such a mindset, the Puritan model is best approached as a good description of human experience, not a prescription for how to behave toward perceived outsiders. That is, the Puritan model of persuasion can help explain why people fail to listen to one another rather than suggest a good reason to dismiss the concerns of others. For the narrower one’s circle of fellowship—the more exclusive one considers his or her community—the more he or she will be apt to consider any piece of criticism as the mere assault of an ungodly outsider. This Puritan model of persuasion—love before logic, the necessity of sympathy for the possibility of persuasion—can guide us as well, then, in our own attempts to change the opinions (or votes) of others. Why do we critique someone, after all? If persuasion is the goal (rather than just pronouncement), we will need to demonstrate first that we find ourselves sharing some kind of community, some common cause or uniting affection. Sending out critiques without this underlying sense of unity will mean that one’s words will probably be taken exactly as one would take them in reverse: as attacks from without rather than assessments from within. People do not consider attacks; they defeat them. We are not changed; we are hardened. Without even the appearance of some unifying, underlying affection, those we most want to persuade will be least likely to listen. That’s something the Puritans once believed, and it seems like a lesson well worth learning again. Then let the debates begin. Image Credit: “Embarkation of the Pilgrims” by Robert Walter Weir. Public Domain via Wikimedia Commons. Abram Van Engen is an assistant professor of English at Washington University in St. Louis who researches and teaches early American literature and culture. 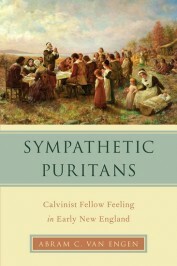 His first book, Sympathetic Puritans: Calvinist Fellow Feeling in Early New England, was recently published by Oxford University Press.